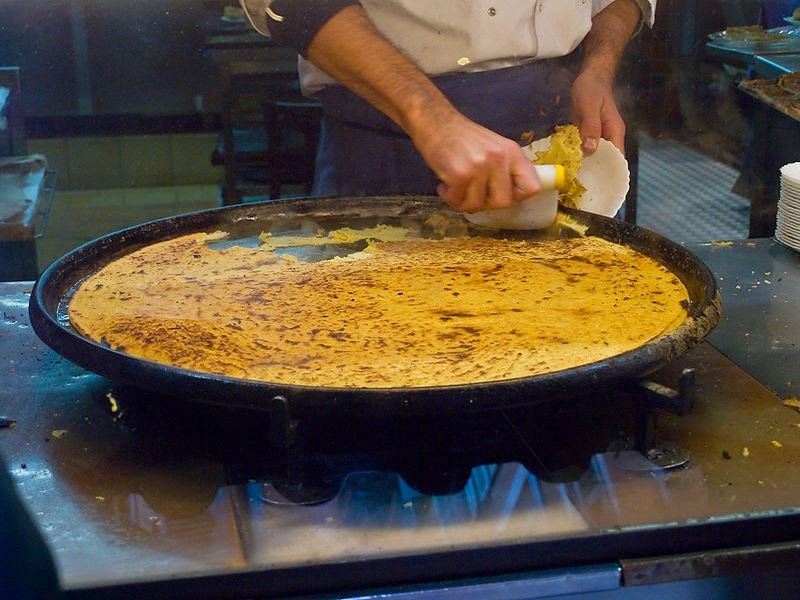 Socca is a flatbread traditionally made from garbanzo bean flour, the kind used to make Papadams. (Hear me out before you say, “No, no, I don’t eat beans!”) The cuisines of India, Algeria, Italy, France, and most of the countries that border on the Mediterranean all have their own special versions of this bread. Socca is naturally gluten-free, grain-free, egg-free, dairy-free (unless you use ghee for the fat), and sugar-free, but it occurred to me that if I substituted besan flour made from chana dal for the garbanzo flour, I could make socca that was lower in carbs and further down on the glycemic index as well. Chana dal are already the most digestible of all beans and preparing them in the traditional, slow-food way, neutralizes most of the toxins and anti-nutrients found in all grains and legumes. The recipe for socca is very simple and easy, but it takes a while to prepare the beans if you want your bread to be as healthful as possible. See instructions below* for soaking chana dal and making besan flour. Remember too, that the batter has to sit for 2 hours before cooking, so allow time for that. You will need a 9- or 10-inch, oven-proof baking dish or pan. An iron skillet is ideal. This recipe makes enough for one thick or two thinner flatbreads. Prepare the chana dal flour by directions below* or use purchased besan flour made from chan dal. In a medium bowl, whisk together the flour, water, oil or fat, and salt. Add spices and/or herbs if using. Let batter rest, covered, in a warm place for 2 hours, stirring occasionally. Heat the Broiler and put the pan in the oven until hot, about 5 minutes. Remove the hot pan from the oven using hot pads or mitts. Coat the pan with 2 teaspoons of oil. Stir the batter and pour the amount for one flatbread into the hot skillet, tilting the pan quickly to cover the bottom. If making two flatbreads, use half the batter for each and add more oil to the pan before cooking the second one. Broil the Socca about 6-inches from the heat for 3 to 5 minutes, until it is firm and the top begins to blister and brown. (In the Old World, they prefer it smokey and slightly charred.) If the top browns before the batter is set, move the skillet to a lower rack and continue to bake until done. The socca should be flexible in the center but crisp and dark brown on the edges. Repeat with remaining batter if making two. Loosen the socca from the pan with a spatula. Slice it into wedges, sprinkle with salt and pepper, and drizzle with a little good quality, extra virgin olive oil. Use it as you would any flatbread, as a base for appetizers, or as a crust for pizza. 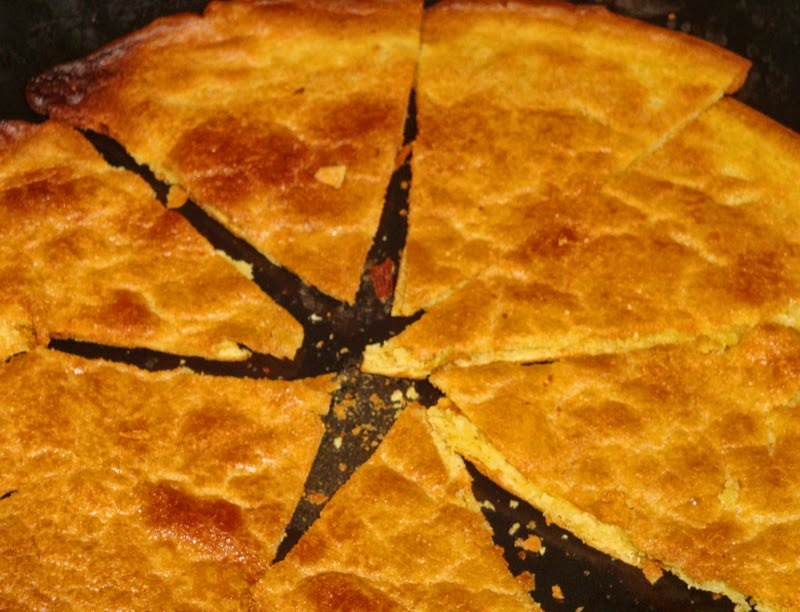 Socca is best fresh out of the oven, but it can be refrigerated and re-crisped for a few days. 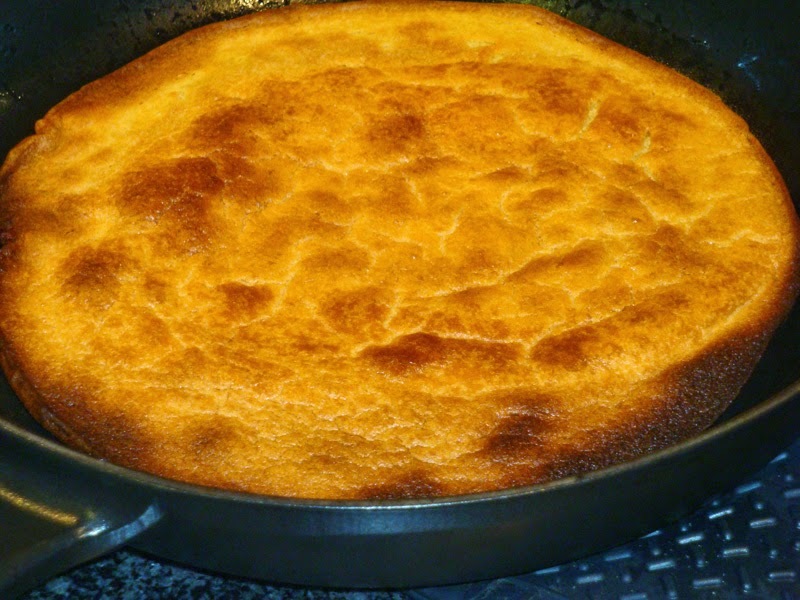 Alternate Cooking Methods: Socca can also be baked in a hot oven or cooked in a skillet on the stove top. To Bake: Preheat the oven to 450 degrees F. Place a 9- to 10-inch, heat-proof baking dish or pan in the oven for about five minutes or until hot. Remove the pan from the oven (use hot pads or mitts). Quickly coat the pan generously with 2 teaspoons of high-heat oil or melted fat and pour in the batter for either 1 or 2 breads. Bake for about 8 to 10 minutes until it is cooked then run it under the broiler to brown the top. To Cook on the Stove Top: Set pan over medium-high heat. When pan is piping hot, add 2 teaspoons of high-heat oil or fat to the pan and pour in the socca batter for either 1 or 2 breads. After about 3 minutes, when the edges are set, loosen the bread and flip it over. Cook the other side for another 2 to 3 minutes, until both sides are firm and well browned. Makes 1 or 2 breads. Calories: 54g; Fat: 2g; Protein: 2.3g; Total Carbs: 7.2g; Net Carbs; 5.2g. Calories: 106g; Fat: 36g; Protein: 4.5g; Total Carbs: 14.5g; Fiber: 4g; Net Carbs: 10.5g. Rinse and pick over chana dal to remove dirt, loose hulls, and stones. Place in a pot and cover with water. Add 1 tablespoon of cider vinegar for each cup of beans. Let stand in a warm place (about 140 degrees) for 8 to 48 hours, changing the water and adding more acid medium every 8 hours or so.to prevent fermentation. Drain and rinse beans and blot on paper or cloth towels. Place in a warm oven or a dehydrater until dry, stirring occasionally. When dry, use a food processor, coffee grinder (a burr grinder is best), a high-speed blender (such as a Vitamix), or a flour mill to grind the beans into a soft flour. Sift the flour after the initial grinding and regrind or discard any hard particles. Grains and legumes contain phytic acid and enzyme inhibitors that can be neutralized by soaking them before cooking. Traditional societies who depend on such foods as dietary staples have learned how to prepare them so they can be eaten safely. Soaking may not be essential for chana dal if you only eat it occasionally, but I think it is worth the effort. It’s easy; it just takes longer. If you only look at the nutrition data for chana dal, you would think they are not very low in carbohydrate, but a low glycemic rank indicates that they contain a lot of resistant starch, which is not digested by human enzymes. It survives to reach the lower digestive tract where it is broken down by gut bacteria and turned into beneficial fatty acids. Because chana dal beans are digested very slowly and help stabilize blood sugar, they have become a diet staple for many vegetarians with diabetes, and certainly a better choice for a source of protein than soy or wheat. 1. Dilawari, Jang B., et al. “Reduction of postprandial plasma glucose by Bengal gram dal and Rajmah.” The American Journal of Clinical Nutrition, Vol. 34, Nov 1981. 2. Dilawari, J.B., et al. “Exceptionally low blood glucose response to dried beans.” British Medical Journal, Vol. 281, Oct 1980. 3. Walker, A.R.P., and B.F. Walker, “Glycaemic Index of South African Foods Determined in Rural Blacks—a Population at Low Risk of Diabetes.” Human Nutrition: Clinical Nutrition, Vol. 38C, 1984. Garbanzo Flour, Papadams, Quick Bread, Socca. Bookmark. I have made those at least 4 times and they are bitter. I heard that if I were to order the preroasted flour that they would be excellent! I have even tried soaking the batter for over night or 1 hour and they are still bitter.Adding onion and other spices etc is still not great. I tried them with Cassava flour and they are way better! Cassava flour is much higher in carbs, though. I haven’t had a problem with bitterness–maybe it varies with the kind of flour?